There are several ways you can effectively increase the lifetime value of your Amazon customer. So, what is the lifetime value of a customer? It is how much money a customer spends with you over their lifetime. With Amazon, it’s a bit more difficult to get your customer to buy more from you because you can’t implement those same marketing strategies you would if the customer were to buy from your own website. 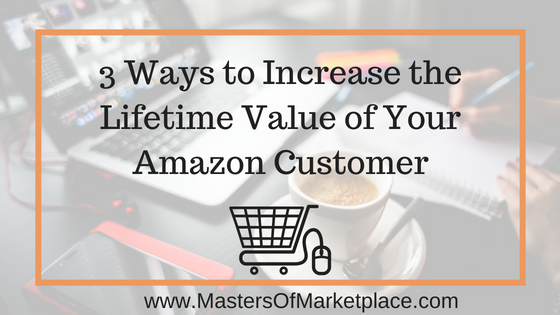 Luckily there are a few different ways that you can increase the lifetime value of your Amazon customer. They’re all fairly simple, and you can start implementing them today. To learn all about these exciting and effective techniques, click below to watch the video OR keep scrolling to read the same information written out for you. If your products qualify for the Subscribe and Save program, Amazon allows your customers to sign up to get your products delivered automatically on a regular basis. So, if you sell consumables like beauty products, groceries or supplements, Subscribe and Save allows your customers who love your products to purchase from you automatically so they never run out and never need to go searching for your product on Amazon. The second opportunity to increase the lifetime value of your Amazon customer is to offer more products in your Amazon store. Adding more products to your Amazon catalogue increases your chances of having your products highlighted by Amazon as ‘frequently bought together,’ which can help to increase sales. The more variety you can offer, the more likely customers are to buy multiple products from you, especially things that go in pairs, or accessories that complement each other. This all increases the likelihood that Amazon will highlight your products together and recommend these combinations to customers. The third thing you can do is invite customers back by offering them a promotion code for their next purchase. You can do this on your social media or through your customer list, but I highly recommend offering promotions directly to your Amazon customers first. There are plenty of programs you can use to do this. I prefer Feedback Genius, which I use with most of my clients whose stores I manage. This program allows you to set up an autoresponder sequence where you’re emailing customers from Amazon after they purchase from you. These messages are sent through the Amazon dashboard since Amazon doesn’t give out customer email addresses; however, your customers will receive an email notification when these messages are sent. Set up your messages using Feedback Genius and offer your current customers a promotion code to come back and buy from your store again. It’s a great incentive for them, and a great tactic for you as a business owner to increase the lifetime value of your Amazon customers. Which of these incentives will you offer to your customers? Try one or more of these today to keep monetizing your business and growing your brand on Amazon! I use these techniques in my agency, Kobel Consulting, and teach others to use them right here at Mastersofmarketplace.com. Browse around to get more information about selling on Amazon, launching your product on Amazon, or even becoming an Amazon store manager. Knowing how to sell on Amazon is such a unique and valuable skill to have. If you’re a virtual assistant or freelancer, offering Amazon as a service is a great way to help business owners and to market yourself to those looking for this specific skill set. If this interests you, make sure you sign up for my email list where you’ll get tons of free trainings and information about how to sell on Amazon, and how you can market this as a service to others. If you’re looking for the accelerated version, you can also join the membership for a very reasonable price and get access to a ton of valuable trainings to help you become a success. Ready to GROW Your Amazon Store? Check out the training right here!